Morzine private ski chalet can cater for individuals and families up to parties of 28 and is the ideal base for winter skiing holidays in the French Alps ski area of Portes du Soleil near Switzerland. This luxury Morzine chalet is also available for private rental. 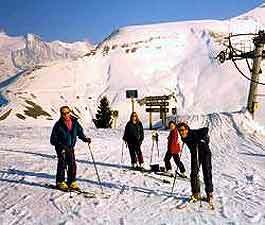 The Portes du Soleil is the largest skiing area in the world and interconnects 12 French and Swiss resorts. Its 204 lifts and 279 pistes criss-cross the Alps in France and Switzerland at altitudes from 1000 meters to 2466 meters. It features in the Europe Top 10 for snow depth and quality, and caters for skiers and snowboarders of all standards. All this skiing is available on a single lift pass! This catered chalet accommodation is available for B&B or full board: - 2019: Good availability If your dates don't match, please scroll down to the links for other chalets and properties to rent in France. 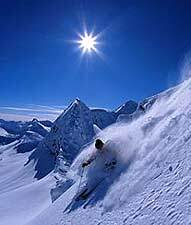 Winter sports holidays in Morzine cater for all abilities and all preferences. Down-hill (alpine), off-piste, and cross-country (Nordic) skiing are all available, as is snowboarding, together with a wide range of alternative winter sports. Snow is the common factor, and there is plenty of it! 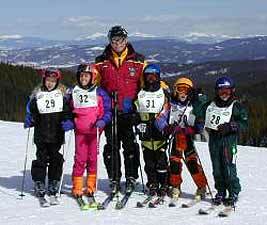 Morzine and Chalet Koala also ensure that children have a happy first and subsequent experience on skis. The Ardent ski lift that offers easy access to Chatel, Avoriaz and Switzerland(!) 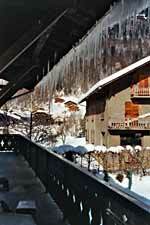 is 5 minutes from the chalet by car, and the ski bus stops at the end of the drive. When convienent, lifts are offered to guests without a car. Nocturnal floodlit skiing takes place at nearby Pleney three nights a week. We can arrange your ski/snowboard and boot hire. Just let us know your size and they will be waiting for you at the hire shop where our guest enjoy a 10% discount. We can also organise ski lessons, guides or instructors, so that you can make the most of the great skiing and fantastic views. Alternatives to skiing include. 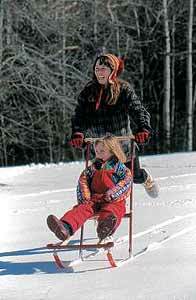 Ice skating, ice climbing, tobogganing, snowmobiles, sleigh rides, snowshoeing, cross-country skiing, parapenting with skies or board, heliskiing, husky sledging, night snowmobiling, etc. The nearby Lake (Lac Montriond) is also the venue for ice-diving. The Morzine fitness centre, which is open all year round, has a sauna and jacuzzi. ... and, of course, apres ski! Our chalet is like a home from home environment for our guests to relax in. Nothing like hotels, which are often quite stuffy! Once guests have stayed with us, we usually see them coming back year in. . . . 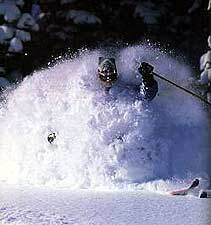 So come and enjoy the skiing with us! 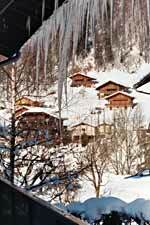 Chalet Koala is privately owned and situated in a small community of French owned chalets that are occupied throughout the year. Built in the traditional French style, the chalet is a blend of pine panelling, wood beams and natural stone. The flexible accommodation and open plan living areas can comfortably cater for small groups, large families or chalet parties at any time of the year. The owners have been running Chalet Koala for a number of seasons and they have the necessary experience and hand picked staff to be able to place the enjoyment and welfare of guests above all else. The spacious open-plan living and dining area is on the first floor. It opens out onto the large sunny balcony that provides panoramic views of the Ardent valley and is a favourite place to enjoy a drink at the end of an energetic day as the sun sets or new snow falls. The living room features a large fireplace and is equipped with a satellite TV, video and a Hi-Fi, along with tea and coffee making facilities. The basement Games Room allows the sports theme to be continued indoors with table tennis, darts and table football. An adjoining 'PS2 Room' is equipped with a TV, video, Hi-Fi and a Playstation 2 for the boys (I meant the children!). A Sauna in the basement helps ease aching limbs after a strenuous day on the slopes and the chalet's in-house bodyworks therapist specialises in a range of treatments and healing. An honesty bar in the lounge helps round off the evening. 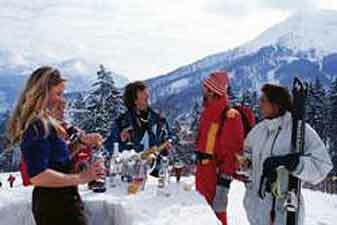 During the Winter skiing season full catering services are provided. These include a traditional breakfast, afternoon tea and an excellent three course evening meal. A packed lunch is optional and dietary requests are catered for, but please advise before arrival. There are games, books and toys to suit all ages. A cot, high chair and buggy are also available, which will help reduce your luggage! Children's meals are served earlier during the Winter season. Jack Frost's child day-care centre is in Ardent by the ski lift. If enough children are staying, it is possible to arrange for Jack Frost's to provide day-care at Chalet Koala. 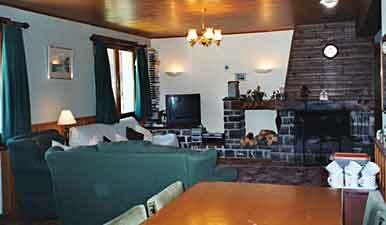 The chalet can accommodate 28 people in 9 bedrooms rooms, which are all spacious, light and airy. 5 bedrooms, all with sinks. 1 with a double bed and bunks (sleeps 4), 2 double rooms with a single (each sleeps 3), and 2 twin rooms. Also on the ground floor are 3 toilets, 2 shower rooms and 1 bathroom. 2 bedrooms and ideal for families with children. 1 double room and 1 twin room with bunks (sleeps 4). Both rooms have sinks and there is 1 toilet and a bathroom. 2 bedrooms. 1 double room with a 2 extra single beds (sleeps 4) an a double room with a 1 extra single bed (sleeps 3). There is a bathroom and a toilet. The 3 bathrooms all have a shower over bath and there are an additional 5 toilets and 2 shower rooms. 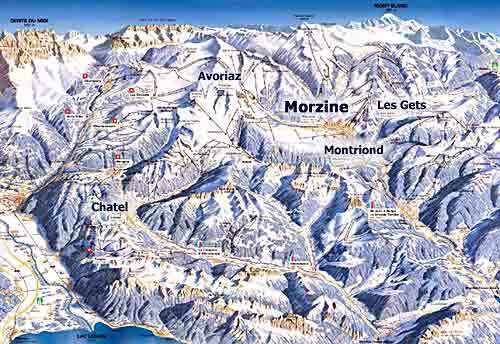 The old village of Morzine is at the heart of the Portes du Soleil ski area that saddles the French/Swiss border. Nestled around its old church, it has escaped the concrete that has ravaged other resorts and retained the charm and warmth of traditional stone and pine chalets. In addition to the skiing adventures that are on offer in the Portes du Soeil area, a holiday at Chalet Koala caters for those who may want a break from the slopes or the non-skiers who have joined a family winter holiday. Places to visit include historic lakeside Annecy, with its old town, shops. Geneva, with boat trips across Lake Geneva to Swiss Lausanne. Medieval Yvoire, and Chamonix where worlds highest lift that takes you to 3,842 meters provides stunning alpine views across to Mont Blanc. 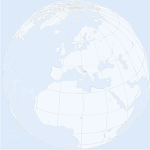 There are regular flights to Geneva (a 1 hour drive) and Lyon airports from most major European cities. 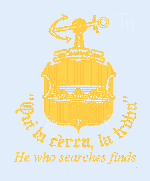 Carriers include Easyjet, Buzz and Lufthansa. If you are flying into Geneva, let us know your flight details and we will arrange a transfer service to meet you at the airport. 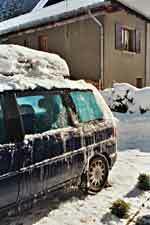 Most of our guests flying into Lyon choose to hire a car, but be prepared for snow! Chalet Koala is a comfortable 1 day drive from the Northern French sea ports (550 miles) to Morzine, which is located approximately 45km East of Geneva on the A44. We can supply a detailed map to guide you all the way. The price ranges from �300 to �400 per person per week in the Winter ski season. The price for the exclusive use of the chalet starts at �6,000 per week. That works out at just �215 per week per person, for a party of 28! Chalet Koala is open throughout the year, and offers B&B and Half Board accommodation in the Summer outside the skiing season. 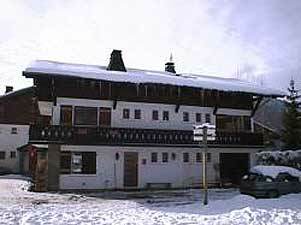 France Chatel Apartment for ski holiday on France Switzerland border Currently long-term unavailable. 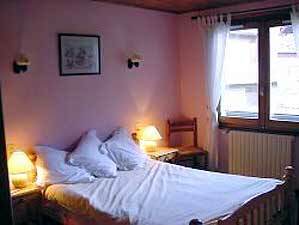 France Morzine, Alps: Chalet accommodation (catered, sel-catering or B&B) in an old part of town on the outskirts of Morzine with fantastic views up the Vallee des Ardoisieres to Avoriaz. Perfect for winter skiing holidays and Summer walking holidays, swimming in the lake or lido, and hiking in the Alps, or for the even more adventerous; climbing, paragliding, climbing, horse riding, white water rafting.... 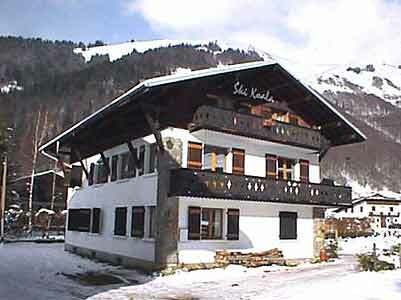 This ski chalet has 5 bedrooms and can accommodate up to 12 guests. Currently long-term unavailable.